Thanks for all the great advice about running shoes and the most important advice was definitely: go forth and get yourself fit for proper shoes. I wouldn't start with a four miler in those. Barefoot/minamalist running is a different beast. 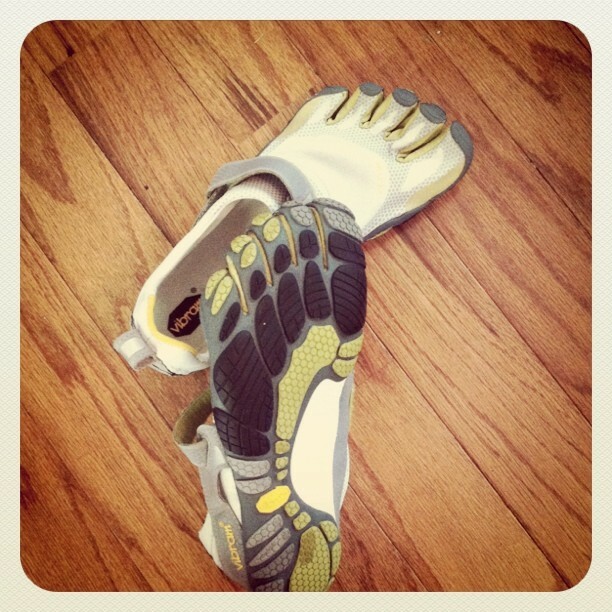 I started with .5 miles in my vibrams and it took me several weeks to work up to a 5k distance in them. Love them. They've helped with my form and turnover, but I only use as a change of pace to my regular running shoes. Have fun! Hey Mere, I'm with Jeremy on this. I've heard that you need to start VERY slow in these… like minutes at a time and then add a little each week. Injuries associated with jumping into these can be season ending. I agree! Be careful, my husband is on the sidelines right now because of a stress fracture in his foot. A simple 4 mile run in his minimalist shoes did him in! Thank you all for your advice and suggestions! I listened… and only did a little ways in the shoes and on the treadmill at that. Thanks so much for your comments! !